Posted January 25, 2019 by Seán Kinane & filed under News and Public Affairs, South America. 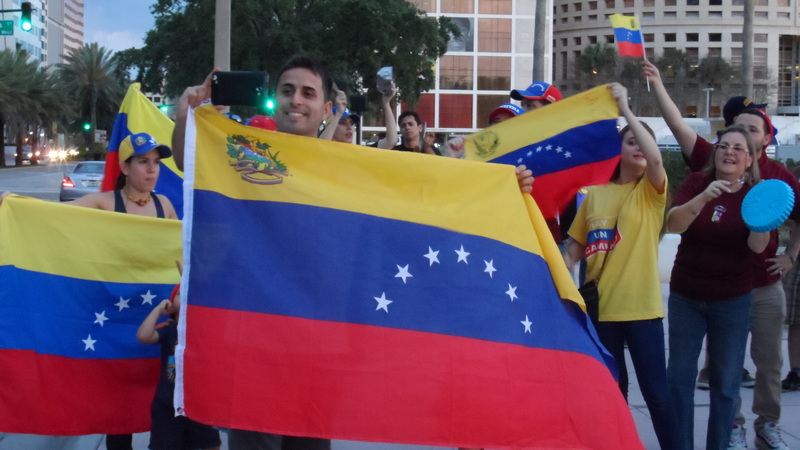 There are two Tampa Bay area protests coming up to support the elected President of Venezuela, Nicolas Maduro, and oppose the U.S. support for the attempted coup. Bryan Ellis is an organizer with the two groups that are coordinating the protests – ANSWER Suncoast and the Party for Socialism and Liberation. “We’re holding these demonstrations in Tampa and Sarasota and around the country to stand in solidarity with Maduro government in Venezuela and the Venezuelan people and the Bolivarian Revolution, which has been a process of democracy and socialism building that’s taken place in Venezuela and the region over the last twenty years. “We’re going to be out there raising awareness that the United States is currently trying to overthrow a democratically-elected government. And that it’s doing this not for human rights or anything like that, but in order to establish its power in Latin America as it has been trying to do in regions around the world in order to dominate resources and markets. You say you’re showing solidarity with President Maduro’s government. But surely, most observers would say that the economy in Venezuela is really hurting and that there’s a dire economic situation going on in Venezuela? “So, when the oil prices fell — the economy’s been reliant on oil since even before the Bolivarian Revolution — when the oil prices dropped, that sent the economy into a tailspin. “The United States and its capitalist sort-of lackeys in Venezuela have also been making the situation much worse through economic sanctions. Unilateraleral economic sanctions, which are illegal under international law and have been doing a lot of damage and a lot of harm to the people of Venezuela by not allowing them to access basic goods. “And also there’s been economic warfare by the private sector in Venezuela, such as hoarding of commodities in order to disturb the markets and to enlarge the black markets. One is Saturday in Tampa from 2:00 – 3:30 p.m. at the Sam M. Gibbons U.S. Courthouse, 801 North Florida Avenue. The other is Monday in Sarasota from 5:30 – 7:00 p.m. at the Marina Jack’s “Unconditional Surrender” Statue, Island Park Drive.